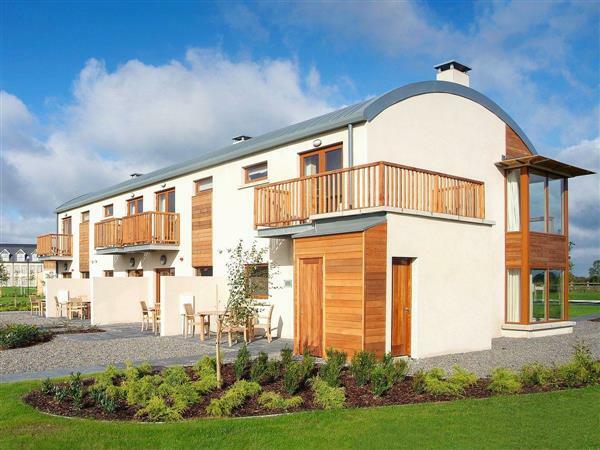 Number 3 at Johnstown Estate Lodges in Enfield, County Meath sleeps 4 people. Johnstown Estate Lodges in Enfield gives you privacy and freedom; these delightful, self-catering holiday properties (refs W32329, W32327 [Number 1], W32328 [Number 2]) provide the perfect home from home all year round for short or longer stays. Situated adjacent to the Johnstown Hotel and Spa, each property has been designed to a very good standard, and boast a lovely terrace for those summer evenings, private parking and full use of the hotels facilities, including a swimming pool and spa with sauna, Jacuzzi and steam room. With the N4 motorway close by, the properties give you the option of taking advantage of both the relaxing countryside and Dublin’s vibrant city centre. County Meath is full of many attractions for all ages and interests, such as Tayto Park, a fun filled park with over 100 attractions (40 minutes), Base Entertainment Centre at Celbridge, which features soft play areas, space bumpers, state-of-the-art bowling lanes, American diner and much more (15 minutes), and AquaZone Waterpark at the National Aquatic Centre, one of the most innovative waterparks in Europe with a host of exciting thrills for all the family (30 minutes). For outdoor enthusiasts, visit Wallaby Woods, Donadea Forest Park with historical features, gardens, ice house and a lovely lake with ducks and birds, and Lullymore Heritage and Discovery Park, with 60 acres of breathtaking landscapes. Explore the Irish heritage, culture and environment, and for the little ones, there’s an indoor forest themed play centre and outdoor play area with crazy golf, pet farm and train trips. The Irish National Stud, the Japanese Gardens and the St. Fiachra’s commemorative garden continue to amaze visitors with their scenery and panoramic views. Dublin Zoo is just 30 minutes’ away. The shop is 2 miles from Johnstown Estate Lodges in Enfield, with the pub and restaurant on site. The properties at Johnstown Estate Lodges in County Meath can be booked together to sleep up to 12 people. Approximate distance to Dublin airport is 48 km. Living/dining room: With 32 cable TV, wooden floor and patio doors leading to patio. 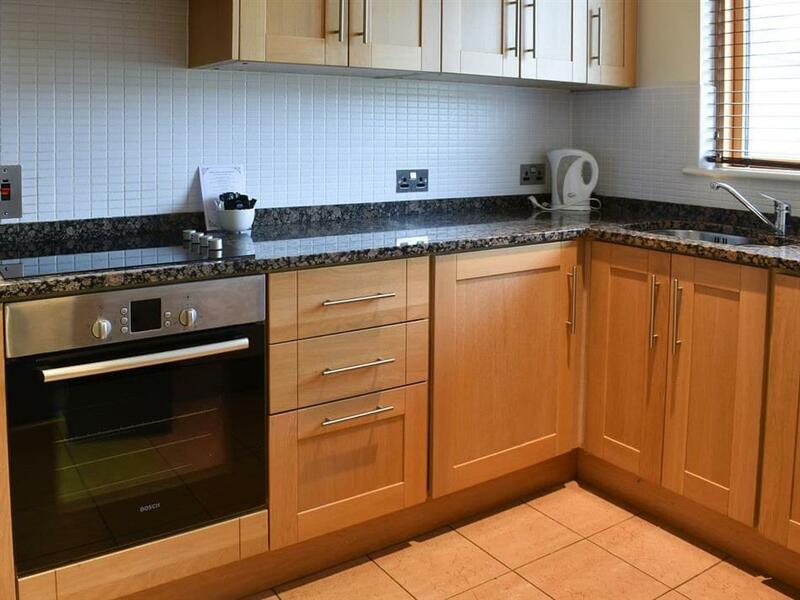 Kitchen: With electric cooker, microwave, fridge, dishwasher, washer/dryer and tiled floor. Bedroom 1: With king-size bed and 20 cable TV. Bedroom 2: With twin beds and 20 cable TV. All properties: Gas central heating, electricity, bed linen and towels included. Travel cot and highchair available on request. Patio. Large landscaped grounds (shared with hotel and other properties on site). Indoor swimming pool (shared with hotel and other properties on site, 20m², depth 1.4m, open 6am to 10pm Mon-Fri, 8am to 8pm Sat, 9am to 7pm Sun, no children after 7pm daily) with Jacuzzi section, hot tub, sauna, steam room and shower facilities. Private parking for 2 cars. No smoking. Please note: There is a water feature in the grounds. Holidays at Number 3, Johnstown Estate Lodges run from Monday to Monday. For a better idea of where Johnstown Estate Lodges - Number 3 is, you can see Johnstown Estate Lodges - Number 3 on the map below. Do you want to holiday near Johnstown Estate Lodges - Number 3 (W32329), you can see other cottages within 25 miles of Johnstown Estate Lodges - Number 3; have a look to find your perfect holiday location.